“The more we try to draw borders between clean and dirty, order and chaos, the more opportunities are created for political acts that expose the unstable and fragile nature of the imposed categories of of modernity and the institutions responsible for upholding them” (The Excess of Modernity; Garbage Politics in Oaxaca, Mexico, 2009). Garbage left on the streets worries us. Might it make us sick? Will it kick off environmental imbalances and catalyze exponential increases to the rat population? The garbage strike becomes the basis for fear at a very, very deep level and it brings us face-to-face with conflicts and tensions that we would rather wish away. Uncollected trash exists as an insult to the notion of how far we have come as a human race, to how completely we have transcended the problems so endemic to the “pre-industrial city,” a place, as Lofland describes it, where “the sheer filth of the streets” was commonplace and garbage as well as human and animal excrement were part of the everyday landscape of the urban (A World of Strangers 32). 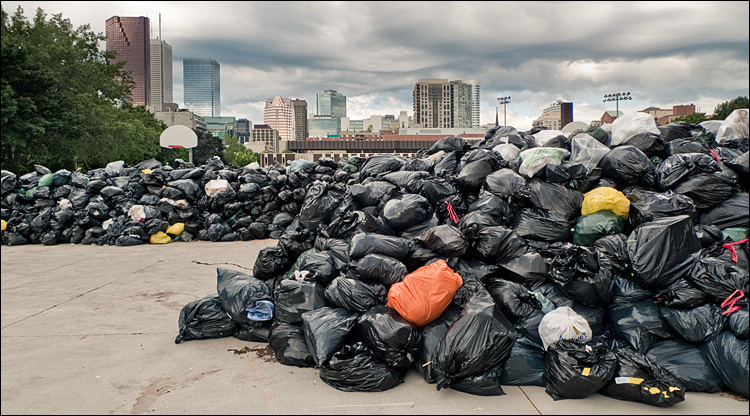 Many people have come to believe that the modern city has little or no connection to the nightmare Lofland describes; by contrast, it is a place in which we should never (or rarely) see or smell our waste. If the garbage cannot be cleared away, something must be wrong in Denmark at the very core of the waste society. The issue is Platonic; notions of the good and the beautiful pull so strongly against the presence of garbage in the streets. In the midst of the strike, borders and prohibitions become fuzzy, porosities emerge, and most importantly, the categories of modernity begin to vibrate. This entry was posted in Labor, Waste. Bookmark the permalink. This really made me think. There is such a fine line between perfect appearance and utter chaos. Yes, we take urban order for granted.